We keep in stock many styles of Cosyfeet and Sandpiper shoes and sandals. We also stock the full range of Sandpiper extra wide knee highs and Cosyfeet soft top and diabetic friendly socks. Ideal if your feet are mis-shapen, sensitive or swollen, these soft and stretchy shoes won’t put pressure on painful toes, joints or swelling. They’re supportive around the heel and the flexible soles are hard-wearing so they’re great for active feet. 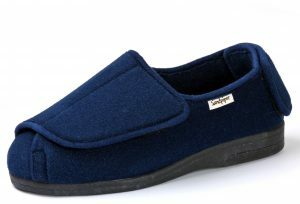 A truly versatile slipper for the most difficult or swollen feet. 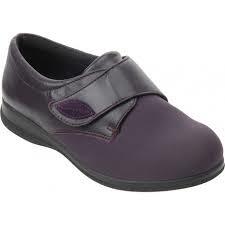 This style is designed to open out completely flat and can be ‘rolled’ up around the foot to give a snug, secure feel. Suitable for diabetics. Extra wide 4E-6E fitting.